Synopsis: A woman is haunted by a mysterious figure after surviving a car crash which claimed the lives of two of her friends. 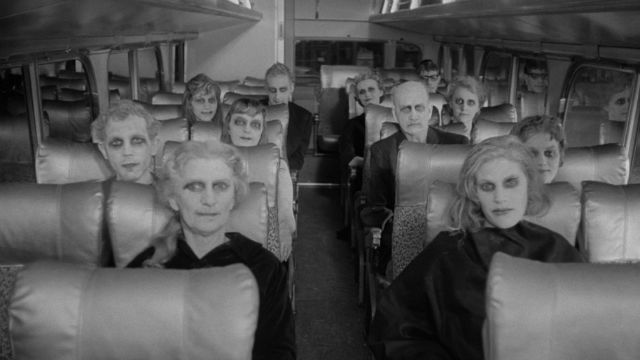 If you’re only going to make one feature-length movie in your career, Carnival of Souls is the kind of thing you want to aim for. The film’s director, Herk Hervey, was involved in the making of around 400 industrial and educational documentaries for The Centron Corporation before his death in 1996, and so he must have grown mighty tired of repeatedly being asked why he only ever made one movie. The idea for the film came to him when he was struck by the silent eeriness of the Saltair Pavilion, an abandoned amusement park with an open-air ballroom overlooking Salt Lake. Suggesting to work colleague John Clifford that the structure would make a wonderfully atmospheric location for a horror movie, Hervey described a scene in which the dead emerge from the lake to perform a dance of death in the pavilion. From this scant outline, Clifford wrote the script for Carnival of Souls and, with an estimated budget of just $33,000 and a crew of five, he shot the film while on a two-week holiday from his day job. It was released as part of a double-feature with Lon Chaney cheapie The Devil’s Messenger in 1962, but failed to make an impression and was quickly forgotten until a late-80s re-release on the Midnight Show circuit led to fresh appreciation of its eerie, ominous atmosphere. The film begins with three screaming girls plunging into a river when their car parts company with the bridge that spans it. Eventually, one girl appears on the muddy river bank, surprising the rescue team that was on the point of abandoning their search of the river’s icy waters. Her name is Mary Henry (Candace Hilligoss), and the accident marks a devastating turning point in her life. After recovering from the accident she starts afresh in Utah, where she moves into a boarding house and begins her new job as a church organist. But Mary finds it difficult to settle in her new hometown. She keeps catching unnerving glimpses of a ghoulish, grinning man in a business suit, and suffers strange episodes during which she can hear nothing and nobody can see or hear her. She also finds herself increasingly drawn to a brooding, derelict amusement park on the edge of town. The world in which Mary struggles to adjust after her crash is strangely different to how it was before, although in ways that she – and the audience – struggle to identify. Everything looks the same and the people haven’t changed, but there’s an eerie ‘otherness’ about it that is created purely from Mary’s reactions to her environment and the people within it. She never really seems to connect with the landlady (Frances Feist) of her boarding house or her neighbour (Sidney Berger, who would play a cop in Adam Grossman’s ill-advised 1998 remake), a young man whose keenness to know her better comes across as more than a little creepy. The unwelcome appearance of The Man – who, incidentally is played by the director, and is reminiscent of an inappropriately gleeful horror comic book host – combined with Gene Moore’s insistent organ music, serves to heighten the off-key atmosphere even further. Carnival of Souls was a film that was years ahead of its time, and fully deserved its re-discovery in the late 1980s. Although it shares some of the technical flaws typical of its low-budget status, and features acting that is best described as variable, it’s set apart from other movies in its B-movie category by its maturity and restraint, and by the fact that it’s a film created by people who are clearly trying to make a work of quality rather than a quick buck.